While the Museum of Pop Culture a.k.a. MoPOP is devoted to exploring what drives contemporary popular culture at large, the museum’s roots are unquestionably in rock n’ roll with a rich history of exhibitions showcasing such rockin’ icons as Jimi Hendrix, Nirvana, and Pearl Jam. In this interview with Senior Curator Jacob McMurray, we learn more about the Seattle institution founded by the late Paul Allen, the Microsoft co-founder who was also a respected musician himself. If you’re not planning a trip to Washington state, keep your eyes open: These exhibits have been known to travel all over the world. Q: What’s been the most popular music-related exhibit in MoPOP’s history? Why do you think this particular show clicked with the public? A: I don’t have any hard data on this, as we don’t have a way to directly measure people entering and exiting specific galleries, but I would say that our Nirvana: Taking Punk to the Masses exhibition has been incredibly popular. We opened it in April 2011 with the intent of having it up on display for 1.5 years and soon realized that it was becoming a must-see at the museum. Because of this, we kept the exhibition on display for 6 years, until early 2017. Then we took it on a tour to Rio and Sao Paulo, Brazil, and then brought it back again. But on the other hand, the opening week for the Pearl Jam exhibition was insane, and I believe that Saturday that we officially opened was one of our biggest ticketed days ever, with over 8000 people in the museum that day. Q: The current exhibition Pearl Jam: Home and Away is the second one you’ve devoted to this rock band. Have you become friends with any of the members of the group as a result? How much interaction do you have with musicians as you put together your various shows? A: Push Me Pull Me: Pearl Jam and the Art of the Screen Printed Poster was our first collaboration with Pearl Jam and that project went extremely well. I think it built up a good level of trust and goodwill with the band, so when we were approached by them to curate a larger, more comprehensive exhibition, we jumped at the chance. the PJ guys are all busy with their music and various endeavors, so we were in touch with each of the members in different capacities, but they all contributed a huge amount of material and time to the exhibition. I’ve had the most direct interaction with Mike McCready and Jeff Ament on this show. But in general, each exhibition is different. Sometimes you get a lot of access and a lot of hands-on interaction, sometimes not as much beyond a general blessing. I think the most important part is that we want to develop a rapport and a level of trust with the artists and their management so that we can create something that we both are proud of. Q: You’ve curated multiple exhibitions devoted to rock poster design. Is there any single poster artist who you can imagine devoting an entire exhibit to? A: Oh man, you’re talking about a past life here, at this point. At one time I was very involved in the screen-printed poster scene. I used to have a screen printing shop with Sub Pop creative director Jeff Kleinsmith and former art director Jesse LeDoux. And even before that, I cut my teeth on poster design just acquiring thousands and thousands of posters for MoPOP’s collection. In any case, I do feel like my sense of the current gig poster scene isn’t much. But going back to what excited me in the first place, it was designers like Jeff Kleinsmith, Mike King, and Art Chantry. Those three are still some of my favorite designers of all time. Q: Some of your exhibitions have toured to museums around the world. Do the exhibits change at all as they move from space to space, simply because of architectural limitations or idiosyncrasies? A: Yes, the exhibition usually do morph – sometimes a little and sometimes a lot. It all depends on the exhibition, how many lenders it has, and where the show is going. The Nirvana exhibition, for example, has around 20 different lenders, so every time that we talk about traveling the exhibition, I have to get approval from all of the lenders. Some lenders are ok with their material traveling, some are ok but don’t want the material to travel out of the US. It all depends. We also might change the content of an exhibition to suit a particular venue. We did that in Brazil, adding some material that related to Nirvana’s shows in South America. It also depends on the venues – different museums may have radically different size spaces, which always require reconfiguring exhibition flow, reprinting some or all graphics, and sometimes trimming or adding to content. Q: What prized pieces of music-related art (artifacts, photos, paintings) do you personally own and treasure? A: I have an extensive collection of screen-printed rock posters from the mid-1990s – mid-2000s, mostly from artists that I really admire, such as the ones I mentioned above. Beyond that, I have sizeable vinyl collection that I take meticulous care of, and outside the realm of music, I have a large collection of books, the covers of which were designed by Richard M. Powers, who was an artist who introduced surrealism to science fiction cover art, and created over 1500 covers from the late 1940s to early 1980s. I’ve got over 500 books that he did covers for. Q: Since you’ve spotlighted Hendrix repeatedly, you’re probably seriously acquainted with his discography. Do you have a favorite song? A: I like all of Hendrix’s catalog, but I’m most partial to material from his early singles and first two records. I love in that period, his fusion of garage-y rave-ups, high-energy R&B, and burgeoning psychedelia. Q: Is there a lesser-known musician you’d welcome making the centerpiece of an exhibit if given carte blanche, simply because you believe the artist has not received the attention he or she deserves and would make a compelling subject? A: Oh sure, if I didn’t have to worry about whether an exhibition would have an audience or not, I would love to do exhibitions on artists like Gilberto Gil, Nils Frahm, The Funky 4+1, Syd Barrett, Robert Pollard, Rammellzee, John Fahey, Laurie Anderson, Alice Coltrane, Donald Byrd, The Oh Sees, … I could go on a long time. Q: What do you have coming up that you’re excited about? A: Yeah! I’m working on a ton of cool stuff, but I can’t tell you about any of it yet! Stay tuned! 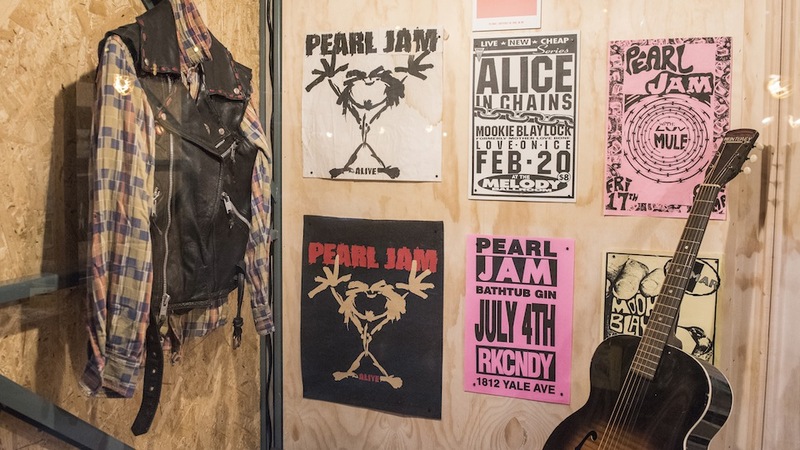 Photo Credits: Image of Pearl Jam exhibition at MoPOP by Jim Bennett; image of Nirvana at MoPOP by Christopher Nelson. Jacob rocks and so do his exhibits! I always look forward to what he has in the works because I know it will be great.